"Cherry eye" is a common term for prolapse of the third eyelid gland. Many mammals, including dogs, have an "extra" or third eyelid located inside the lower eyelid. This serves as an additional protective layer for the eye, especially during hunting or fighting. The third eyelid contains a gland that produces a significant portion of the tear film. 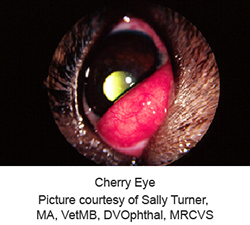 When this gland prolapses or "pops out", the condition is known as "cherry eye". What are the clinical signs of "cherry eye"? Prolapse of the third eyelid gland appears a red swollen mass (named by its resemblance to a cherry) on the lower eyelid near the nose or muzzle. The "cherry eye" may be large and cover a significant portion of the cornea or it may be small and appear only periodically. Any sign of "cherry eye' should be brought to your veterinarian's attention immediately. 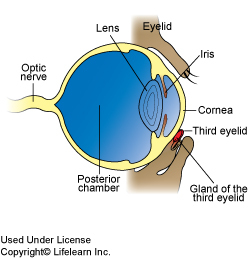 The gland of the third eyelid is normally anchored to the lower inner rim of the eye by a fibrous attachment. In certain breeds, it is thought that this attachment is weak, which allows the gland to prolapse easily. The breeds most commonly affected include cocker spaniels, bulldogs, beagles, bloodhounds, Lhasa apsos, Shih tzus, and other brachycephalic breeds (dogs with "squished" faces and short limbs). Burmese and Persian cats are also reported to have "cherry eye". What is the treatment of "cherry eye"? "Treatment involves surgical replacement of the third eyelid gland." Treatment involves surgical replacement of the third eyelid gland. It is important to treat the condition as soon as possible in order to minimize damage. This is critical because the third eyelid gland produces up to fifty percent of the watery (aqueous) portion of the tear film. Without adequate tear production, your dog is much more likely to develop "dry eye", which can seriously impair vision. Your veterinarian will discuss the appropriate surgical technique that will best suit your pet's condition. "In most cases, the gland returns to normal function within a few weeks of surgery." In most cases, the gland returns to normal function within a few weeks of surgery. Approximately five to twenty percent of cases may experience a re-prolapse of the third eyelid gland and require additional surgery. Many pets that have a prolapse in one eye will eventually experience a prolapse in the opposite eye. Surgical replacement of the third eyelid gland is always the first choice of treatment due to the risk of developing "dry eye" if the gland is lost. In severe or chronic cases, there may be no option other than removal of the gland, especially if the function is severely diminished or absent.